I read Julia Heaberlin's Playing Dead a few years ago and really liked it. 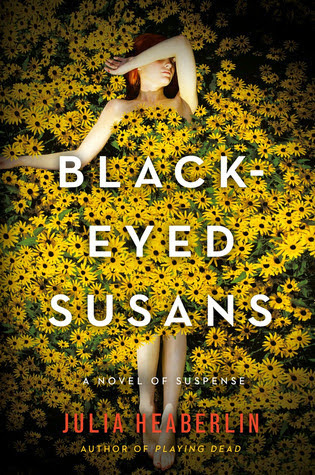 When I got the opportunity to read her latest novel, Black-Eyed Susans, I jumped at the chance. Right from the start I was hooked to this story about a woman who is revisiting her own kidnapping two decades before, when she was sixteen, trying to put a face to the man who left her to die in a shallow grave alongside his other victims, already dead. The narrative of the novel alternates between Tessie at 16 and her adult self, Tessa, which affords the reader the perfect view of the impact such a traumatic event can have on a person, both immediately following an event and years later. Tessie's last memory before waking up in a grave was of going to the store to buy a candy bar for the homeless man she always passed on her run. Not only does Tessie have no memory of those hours she was missing, but she also suffers from hysterical blindness. She finds herself in therapy yet again with the trial looming before her. Her best friend, Lydia, has stood beside her throughout, offering Tessie support and guidance. She's the only one who treats Tessie the way she always has, which is a relief given how everyone is so careful around her. Even in her traumatized state, Tessie is every inch a teenager: questioning authority, not quite trusting the adults around her, and needing to have some semblance of control over what is happening to her. Tessie doesn't have much to offer in the way of who kidnapped and tried to kill her. She does not know if it is the man arrested and being prosecuted is the one who did it. She can only testify to what she remembers. Fast forward to present day Tessa who is a single mother with a teenage daughter of her own. She has long doubted that the right person was convicted of the crime, and, with his execution fast approaching, she feels she must do what she can to save his life. Her doubts are heightened when she finds Black-Eyed Susans newly planted outside her bedroom window, Black-Eyed Susans being the type of flower that had covered the grave she had been found in at 16. It wasn't just that though. There had been little things over the years that make Tessa doubt the killer has been caught--and make her fear that he is still out there--taunting her. Working with the appellate team to help save an innocent man from death,Tessa provides what help she can as the team attempts to identify the other victims whose bones were found in the grave. DNA analysis is much more advanced now than it was in 1995 when the trial had taken place. And the hope is new evidence will come to light. This is an intensely suspenseful novel that I found extremely difficult to put down. I was particularly interested in the science of the investigation, especially in just how far we have come in being able to narrow down where a person comes from based on DNA and chemical markers. The author clearly did her research. Heaberlin avoids going into graphic detail about what happened to Tessie and the other victims, and yet she does it in such a way as to leave no doubt that what they endured was horrific. I thought this was a nice touch, and says a lot for how talented a writer Heaberlin is. Several different theories went through my mind as I read about the who and why of it, but I was never quite sure enough to want to say out loud. I admit the ending (nothing to do with the who or why of it) gave me pause in terms of just how much I enjoyed this book in the end. I loved it while I was reading it, but once finished I wondered if the envelope of believably hadn't been pushed a little too far. But I could just be overthinking it. I probably am. Ultimately, I believe Julia Heaberlin proves yet again what a gifted storyteller she is, especially when it comes to psychological suspense. To learn more about Julia Heaberlin, and her books, please visit the author's website. Oooh, I love this sort of books - I must remember to check it out! Eustacia - I hope you do! I love the premise of that and can see why it was hard to put down. The cover is terrific too! Kathy - I like the cover too. It was such a compelling read. I highly recommend it! Jenclair - I can see why it's one of your favorites. It was really good. This really isn't my usual type of book, but this one sounds so interesting! Shaina - I seem to be on a roll with reading good crime fiction novels. I really like this author's work. I've got this one on my list already. I'm amazed too at how much more they can tell about crimes based on forensics. Looking forward to reading this. The cover is pretty, but rather creepy in a way. Kay - Science and technology have come so far. I hope you enjoy this one when you get to it, Kay. This is another book that I already have on my GR 'Want To Read' list, we obviously share quite a like taste in books - I do enjoy my murder/mysteries and thriller/suspense stories and have come across one or two really good new voices in the genres. That opening line alone would be enough to have me hooked, but your overall review was so interesting and intriguing, without giving too much away, that I can't wait for this one to get to the top of my TBR pile! On a completely different tack - I was wondering if you have a Twitter or Goodreads account, so that I can keep abreast of your latest reviews and recommendations, together with any new books you have acquired? Yvonne - This is one of my favorite genres too. I hope you like Black-Eyed Susans when you get to it. I have both a Goodreads and Twitter account. :-) I'm under @LiteraryFeline on Twitter. And my Goodreads address is https://www.goodreads.com/user/show/2257721-wendy (Wendy Runyon). "This is an intensely suspenseful novel that I found extremely difficult to put down." Joy - I hope you like it if you read it. I will be curious to know what you think! This does sound like quite a read! It's too bad that the end gave you pause though that does happen to me sometimes with this genre. I'm really looking forward to trying this one and am glad to hear that it's not over the top graphic. I was worried about that. Katherine - The imagination will make this one dark enough for you, believe me! I really enjoyed this one and Julia Heaberlin is now on my must read author list. 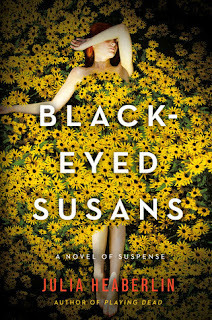 Black-Eyed Susan sounds like an intense read. And if the author avoids going into graphic details about the kidnapping, but lets the reader know how awful it was without saying so, she is talented. I enjoy reading about the process of investigations too, it makes it seem even more realistic. Great post, glad you liked this one! Naida - Yes, I think Heaberlin is very talented. I have another book by her waiting in my TBR pile. I hope to get to it soon. I think I'm reading this one next so I skimmed but I'm glad to see that you liked it. Lisa - I look forward to reading your thoughts on Black-Eyed Susans!